I am writing on behalf of Kenneth J Smith, the husband of Christine Smith and father of Benjamin and Leon Smith. Ken was in the Army for 10 years and then became an engineer and mechanic on the Manitou and Pikes Peak Cog Railway where he worked for 12 years .He was also a volunteer firefighter in Security, CO for 10 years. 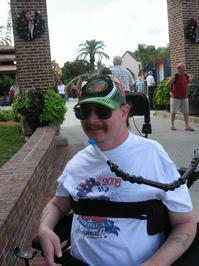 Ken suffered a life changing spinal cord injury and broken neck in a motorcycle accident in March 2008. Ken was forced off the road by a hit and run driver who was talking on a cell phone. That driver was never caught. Now a quadriplegic with no use of his legs or left arm and very limited use of his right arm, Ken has spent 4+ months in medical and rehab facilities. In spite of the many struggles that he faces including the loss of 60% of their income, Ken remains hopeful that he will be able to return to a productive life in the community through the support of family and friends. He and Chris have had to have extensive remodeling work done to their Security Colorado home to make it accessible for Ken. More work still needs to be done so Ken can continue with his rehab at home. Ken is hoping to enter an intensive therapy program that will strengthen his body and help him regain as much function in his arms and legs as possible. Chris and Ken are hoping to have an addition on their home which will allow Ken to continue with his daily therapy which will provide him greater mobility and independence. The cost of the additional renovation is approximately $50,000. To assist with this expense and other injury related expenses a fundraising campaign has been established with the catastrophic injury program of HelpHOPELive. HelpHOPELive is a nonprofit organization that has been serving the transplant and catastrophic injury community for nearly 30 years. All contributions are tax deductible and are administered for injury-related expenses only. The most immediate need currently is an accessible van to replace the original used van which has become unreliable mechanically lately. We’re having trouble with the brakes, radiator, power-steering and driver side window! If you are able to and would like to contribute to this campaign, it would be greatly appreciated! For you convenience, HelpHOPELive is also able to accept credit card contributions by calling them at 1-800-642-8399 or by clicking the DONATE NOW button. It is hard to believe it has been 9 years since my hit and run accident that left me a c-5 quad. Doctors told me I would be lucky to live 5 years. It has not been easy. In 2012, I had to have emergency surgery to remove a very big bladder stone that nearly killed me with sepsis. In 2014, I underwent another surgery so I could continue to breathe on my own. In 2015 Chris decided to stay home to care for me full time. With the love of my wife and sons, I continue to do well. Thank you to all who continue to donate to my fund. It has been a big help. Thank you to one and all who made donation to help cover the cost of getting a newer van. We now have a van that will allow Ken to enter and exit without smashing his head and jamming his neck. We greatly appreciate all of your help. 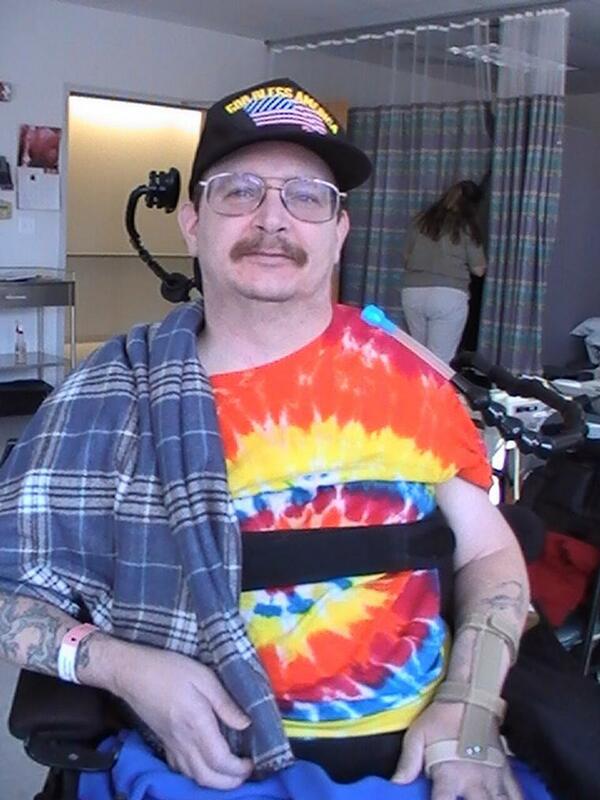 With your help we have also been able to cover some more of Ken continuing medical costs. As of 2014 Ken has had to under go an additional surgery on his neck that allowed Ken to continue to breath on his own. Ken has had other medical issues over the last few years that have put him close to death. While this surgery has helped Ken greatly we realize our time together may be limited. We are now in urgent need of replacing the only vehicle we have. Ken also wishes to visit his family on the east cost and we are hoping to go for a visit very soon. Hope all is well and the campaign is successful. I'm a friend of Jimmy's & Crystal's. Hi Ken, Hope Christine and you have a wonderful Christmas. Take care. Go Jimmie Johnson! Love you and pray for you. Your wife, Christine's dedication to you is really great. We pray for the use of your upper body asap. Love, your dad & mom. Ken, You are always in our thoughts and prayers.